Anyone who works long hours has the potential for burn out. 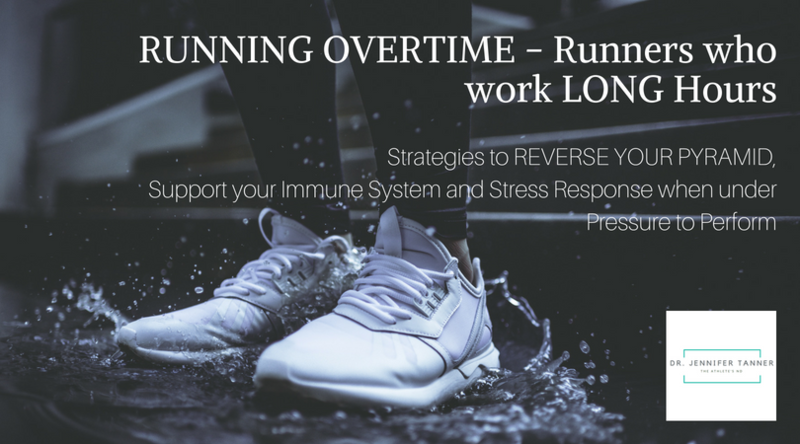 Runners, athletes and those who are trying to whip themselves into shape who work long hours AND train in their spare time are at a higher risk for burn out and a run down immune system. Exercise is a fantastic tool for stress modification, however, overtraining without adequate recovery can lead to decreased performance and fatigue[i]. Enabling these habits over longer periods of time can lead to adrenal fatigue, a condition that leaves you feeling tired and run down. If you are like many other dedicated downtown executives, your job is demanding and requires you to go above and beyond in order to survive. Throwing exercise into the mix can help offset these stresses, but too much can leave you with headaches, muscle aches, foggy thinking and feeling irritated. These are all signs that your Adrenal Glands are having a hard time keeping up the pace. The adrenal glands have many functions, including the secretion of cortisol and other hormones in response to stress. Having a busy work load with no down time can be a stressor on these organs, therefore adrenal fatigue is common amongst busy executives and serious athletes. Adrenal fatigue is a term applied to a collection of nonspecific symptoms, such as body aches, fatigue, nervousness, sleep disturbances and digestive problems, but is not a medical diagnosis[ii]. Calorie restriction, sleep deprivation and excessive exercise all stimulate the release of these stress hormones. Overtime, changes in cortisol levels can lead to depression, injury, panic disorder, malnutrition and weakened immunity[iii]. Left untreated, this can create a situation that is difficult to bounce back from. The adrenal glands, can become exhausted and unable to effectively do their job leaving the window open for chronic pain and inflammation[iv]. What are other Symptoms of Adrenal Fatigue? How does Adrenal Fatigue relate to my fitness? When you are busy, stressed and overwhelmed, adding something else to your to do list can be daunting. However, working on foundational support is what is going to get you through this bump in the road. It isn’t always realistic to cut back our hours (if you want to keep your job that is!). So we have to be creative in how and create a strong foundation. Think of yourself as your bodies engineer. You need to make sure the building has a secure support system in place, so it doesn’t topple over. Burning the candle at both ends leaves a weakness in the foundation. 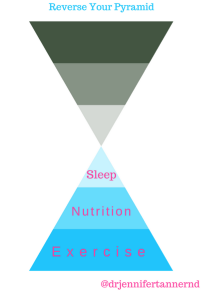 We need to REVERSE OUR PYRAMID. What are the Foundational Strategies? Most of us are scrapping by on the 6-8 hours. But when taking a quick look at some of the top pro athletes, they are getting 10-12 hours[v]! Signs you are not getting enough sleep can be decreased reaction time, slower metabolism, decreased strength, and a sense that you are exerting yourself much harder than you actually are. Go to bed (before midnight) and wake up at the same time every day. Take the WHOLE FOOD challenge. By eating real unprocessed foods, you automatically reduce your intake of sugars, saturated fats and white flours. This part you already know. Be sure to work in down time and increase the intensity by 30% at a time to avoid injuries. If you have adrenal fatigue, Intermittent Fasting may be contributing to your symptoms. One of the major dietary mistakes made by people with low adrenal output is not eating soon enough after waking. Eating your first meal before 10:00 am can help replenish blood sugars from the previous night. An early lunch, between 11:00 am and 11:30 am, is better than a late lunch. Your body quickly uses up the morning nourishment and is ready for more. Eat a whole food snack between 2:00pm and 3:00pm to sustain yourself for the cortisol dip that typically occurs between 3:00pm and 4:00pm. Your evening meal should be eaten between 5 and 6 PM[vi]. A high quality snack before bed can help you get through sleep disturbances (2 slices of turkey, apple slices or banana dipped in nut butter). What foods support my Adrenal Glands? Sea Salt. As long as your blood pressure is 120/80 or lower, add a pinch of seasalt to cucumbers and your work out water. Coconut Oil or Flax seed Oil: Include 1-2 tbsp’s (Note, Do Not cook with flaxseed oil, this can be added on after cooking). Papaya and plums in the afternoon. Aim to keep fruit after lunch. 7+ servings of red, yellow, green and purple vegetables! Add vegetables to each meal (eg. Sautéed spinach with an egg for breakfast, kidney bean and cabbage soup for lunch and steamed broccoli with salmon for dinner). Can Supplements Support my Adrenal Glands? Acupuncture and IV Vitamin Replacement Therapy are modes of treatment to be considered to restore balance and replace deficiencies. If you are feeling like you are RUNNING OVERTIME, it is a sign your Adrenal Glands need support. Together we will create a program designed to support you and your active lifestyle. 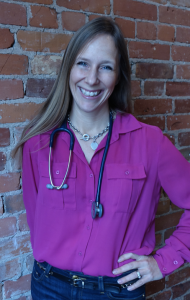 Dr. Tanner, ND is available for Complementary 15 minute consults. Disclaimer The information provided is for informative purposes and is not intended to substitute professional medical advice, diagnosis or treatment.